With leading strength and toughness these tarps are built to go the distance. Being extra thick and extremely strong they block out more light than a typical tarp and a far more resistant to tears and holes. These tarps excel at covering anything that you want to remain dry, shaded, or protected from damage and will be your best friend from camping to boating to back yard lounging. 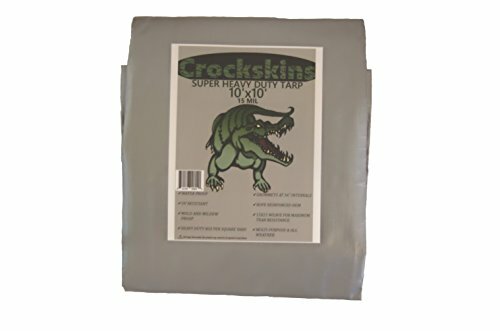 SUPER HEAVY DUTY- Being thicker and denser than the competition with a 15x15 weave, 8oz per square yard, and 15mil thickness these tarp's strength are well beyond a typical consumer tarp. REINFORCED STRENGTH- With double reinforced corners and rope sewn edges these tarps have maximum tear resistance. EXCEPTIONAL WEATHER PROTECTION- By being UV treated, laminated, and heat sealed these tarps have exceptional resistance to fading, are waterproof, and prevent mildew and mold. INCREDIBLE VERSATILITY- So many uses and reversible. Sun shade, camping ground cover, construction cover, watersheds, vehicles. Limited only to your creativity. TIE DOWN AND FORGET- With aluminum grommets every 3 feet (36 inches), tough edges, rigid construction, and great weather resistance, the tarp will be there until YOU decide to take it down. If you have any questions about this product by Crockskins, contact us by completing and submitting the form below. If you are looking for a specif part number, please include it with your message.